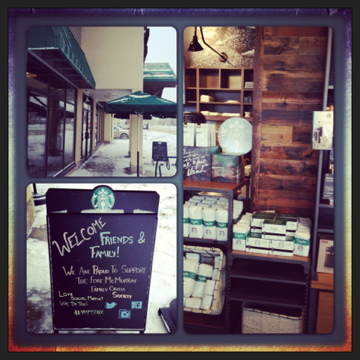 McMurray Musings: Community and Coffee - Starbucks Opens! Telling the story of my life in my home - Fort McMurray, Alberta. 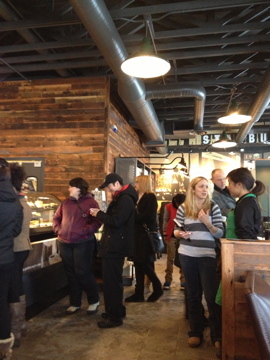 Community and Coffee - Starbucks Opens! There are few things I find more exciting than a grand opening. The opening of a new business of any sort thrills me, but especially if it touches on one of the things I am crazy about. For the record I am nuts about clothing, shoes, and coffee, and when I heard about the "sneak peek" opening for the new Starbucks on Franklin Avenue I knew I had to go - because coffee is what runs through my veins. I've watched the building go up with anticipation. 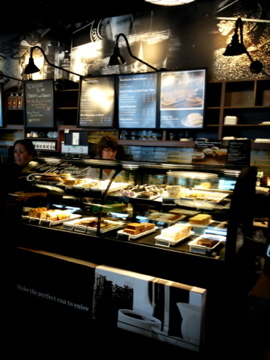 I happen to be a "Starbucks girl", loving everything about them from their coffees to that wicked cheesecake brownie they've been serving to the green aprons to their business philosophy. 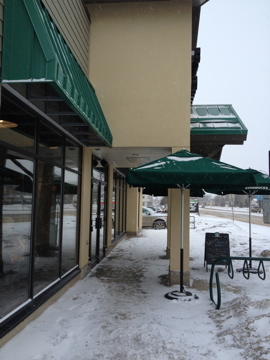 Last night the new, and Fort McMurray's only, stand-alone Starbucks opened its doors for two hours. 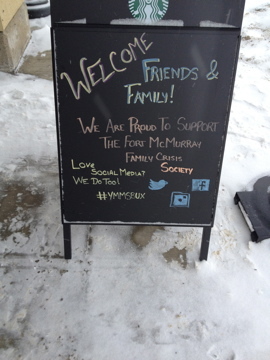 For those two hours you could enjoy live music, check out the new atmosphere, and get a free drink and food - all for a donation to the Family Crisis Society. That sort of community social profit and corporate partnership is what makes my heart sing. That sort of collaboration makes me smile, and so did the sign that greeted the Intrepid Junior Blogger and I when we arrived. 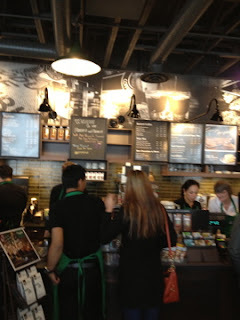 It looks pretty much like most other Starbucks, but I love the walls and unfinished ceiling. I love the free wifi. I love the tables and soft chairs. 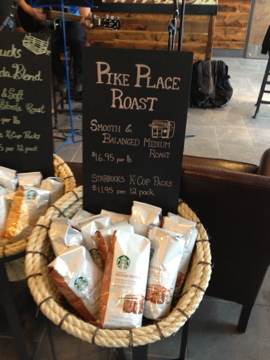 I've been looking for a new coffee spot to call my own recently, and I think last night I found it. I wanted a place where I can sit and think and read and research and write, hold interviews and meet with friends. 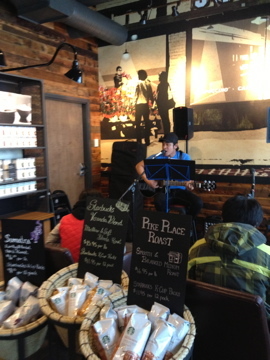 I think this is the place. It was packed last night, full to the doors, and rightfully so as it benefitted both a wonderful local social profit organization and gave community members a chance to huddle indoors, away from a cold and blustery day that seemed so cruel given our recent spring-like weather. The weather outside was nasty, wind blowing and snow falling, but inside Starbucks it was warm and cozy. The staff was all smiles, wearing their green aprons, slinging drinks and food, and keeping their calm despite the chaos around them. And I like that, because that is exactly how I work, too (like a duck on water, calm on the surface and paddling like hell down below). I have already set up my first "business" meeting there, for this week in fact, and plan to take a friend there this weekend for coffee as well. I hope in the future to approach the new owners and managers about organizing a little "ymmtweetup", just a gathering of folks from Twitter (or anyone who wants to come, really) to meet and chat and drink coffee and enjoy each other's company. 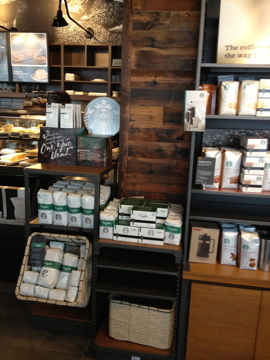 I write this early in the morning and my first stop on my way to work will in fact be the new Starbucks, and I expect by next week they will know me by name and drink order. This is what I have been waiting for, you see. 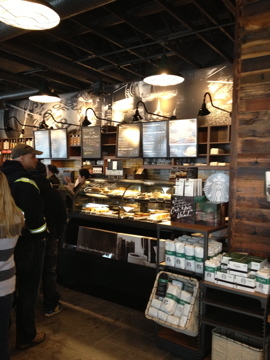 This is just another sign of the future that is coming to Fort McMurray, a future that includes things I have so missed like a stand-alone Starbucks (and while I love the folks who work at the Safeway Starbucks the atmosphere is a bit lacking). This is a sign of more good things to come, about exciting new places to drink and eat and shop. 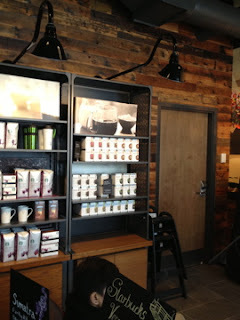 And speaking of shopping now that we have a stand-alone Starbucks I find myself hoping for a Nine West shoe store. Hey, a girl can dream, can't she?